The Tremonti phaser is a Mark Tremonti (Creed, Alter Bridge) signature guitar pedal, but that shouldn’t stop us from trying to get the most of it for bass too! The Tremonti has 4 knobs and a 2-way toggle switch, plus the obligatory footswitch and LED to indicate when it’s on and off. 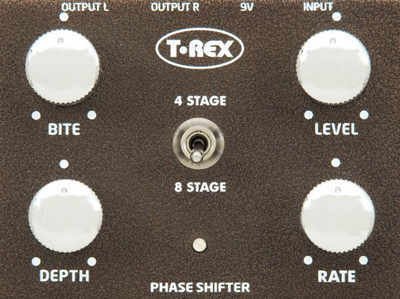 The RATE and DEPTH knobs do exactly what you would expect – controlling intensity of the modulation. The LEVEL knob gives you independent control over the overall output level of the pedal in case you need to counter adjust for the change in perceived volume you may experience after the effect is kicked in. The toggle switch simply allows you to choose between 4 or 8 phase stages, offering two variations of the characteristic phaser flavor. Finally, the DRIVE knob, which is not really an overdrive feature, adds a touch of grit as you crank it up. It turns out that this is pretty cool for a particular type of effect… More on that later! 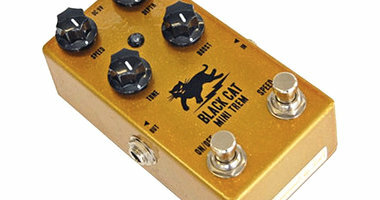 There are 6 rounds of sound clips in this review, allowing you to explore how this pedal sounds on a solo bass part with a mix of root notes and overtones, a Leslie organ-like simulation on root notes and ‘mini chords’, slap, slap 8-STAGE, slap with dirt and finally some high-register playing. Please note that even though the photos embedded with the Soundcloud sound clips indicate an 8 STAGE phase setting, it is actually 4 STAGE except for the 4th Round of sound clips. The Tremonti is versatile in the sense that you can tweak a range of usable tones out of it, even considering the 8-stage setting being less useful on bass, you can get a nice shimmering, chorus-like tone as well as more funky and swirly sweeps and the crunchy Leslie emulation can really be cool for some very particular types of bass lines and grooves. However, if you are not into messing around with chords, overtones or an organ-wannabe, these option may well matter less to you. The Tremonti Phase Shifter is not overly heavy considering its size (roughly twice as big as a standard MXR pedal), but it feels solid. I have had no issues with this unit so far. While you could hassle a bit about the size, the design does make it easy to adjust the knobs or flick the toggle switch on the fly. Some ‘standard-sized’ pedals has a toggle switch tugged in between two closely-located knobs, making it tough to toggle without accidentally giving one or both knobs a little notch. I like it when pedals don’t take up too much space on the board, but recognize that comfort can be a real issue too. That said, for bass (to me at least), the toggle switch would be permanently set to 4 STAGE so this is not really an issue after all. One thing that should be mentioned is that I did hear some noise being introduced when kicking in this stompbox. I guess in combination with distortion on a guitar, that’s no issue whatsoever, but on a bass part like the one in Round 1 of the sound clips (solo bass playing overtones), it is in fact quite audible. 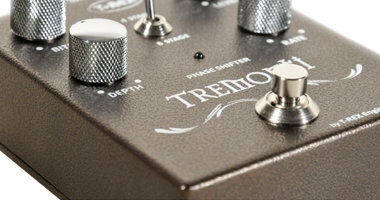 At the time of writing (2015), most dealers no longer has a new Tremonti Phase Shifter in stock, but you can find one on Amazon at about $160. The list price is $369, which is quite steep, but the actual $160 is more reasonable. It would be shipping from Japan though, so expect additional cost in that regard. Ultimately, even considering the lowered street price, the value for money is not overwhelmingly high. Considering the list price, it is downright poor. The tone I like the most in the Tremonti Phaser is the leslie-like setting with added dirt. It really has an edge. It also does add a nice shimmering touch to flageolets in a chorus-like, yet different, manner. 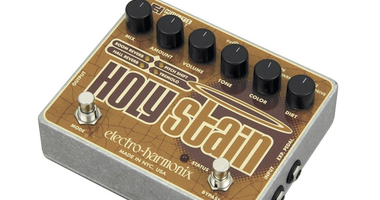 I like this pedal, but I don’t love it.